Despite only visiting it once in my adolescent years, I've never forgotten the Cradle of Aviation Museum in the suburb of Garden City. Row after row of majestic aircraft stood next to each other, shiny but defunct evidence to the pivotal role that Long Island played to the science and practice of aeronautics in the 20th Century. Even throughout the guided tour, there was a stately kind of quiet, an air of reverence that hung throughout the space. Playing through Halo: Combat Evolved Anniversary reminds me of walking through the Cradle of Aviation Museum. That place isn't a world-renown venue like the Museum of Natural History or the Guggenheim, but rather it's one of those mid-tier shrines dedicated to a particular phenomenon. It's a physical space reserved for a special kind of contemplation and the 10th birthday re-master of the first Halo game strikes me as a virtual equivalent. Stretching out the metaphor a little more, it's almost like looking at carefully restored masterpiece painting—craning your eyes upwards at the Sistine Chapel ceiling, perhaps—after preservation work's been done. There's a new vividness to be found in something you might've known intimately before. Make no mistake: Anniversary is an impressive achievement from 343 Industries—the Microsoft division that will steer the course of Halo in the post-Bungie era—and dev studio Saber Interactive. With the Classic Mode option to go back to the game's original graphics with the press of a button, you're essentially getting two flavors of the same experience running simultaneously, one on top of another. Otherwise, Anniversary doesn't make Combat Evolved feel different. Well, that's not entirely true. In terms of visuals, it brings Bungie's mega-success in line with other AAA games of today. Half the fun of playing is going back and forth and comparing how things looked then and now. Neither of these were in the original Combat Evolved. Achievements are also threaded into the game, as are Terminals, video stations hidden throughout the world that expand the series' mythos—and seed foreshadowing for Halo 4. None of the tantalizing narrative hints towards the series' future actually make the experience of playing Halo all over that divergent than the original experience was. Yes, you get all kinds of teases and hints about what might be happening when you get to play as Master Chief again. But you already need to be super-invested in the lore to make sense of these snippets. You'll also find Skulls, the power-ups that reward you with special abilities in both campaign and multiplayer, throughout the game. In terms of gameplay, going through the campaign's levels feels a little quaint. One realizes that Halo's understated majesty may have simply been a matter of technological convenience in 2001. This time, all that space comes across as a reverential design choice now. Some things don't need to change, though, like the still-impressive enemy AI. The strafing and charging of the Elites, the rolling and dodging of theHunters Jackals, the fearsome power of the Brutes Hunters… they all stick combine to keep you constantly on your toes throughout the campaign. Classic Mode essentially bakes in a nostalgia mechanic into a game that's already well-loved. The Kinect features are mere novelty, letting you, among other things, switch to Classic Mode and back, throw grenades or enter an alternate viewing mode with spoken commands. Once in Analyze mode, the Scan function picks out and adds certain elements to a database for later perusal. There's noticeable lag between certain voice commands and the execution, and for all the shouting you'll do at the screen, none of it adds terribly much. "I&apos;m sorry Chris, I&apos;m afraid I can&apos;t let you do that"
Aside from the visuals and Kinect functions, the other big region of change is in multiplayer. Some of the classic maps from the original Halo get the same kind of visual retooling as the campaign does, running inside the engine of 2010's Halo: Reach, Bungie's goodbye to the universe they created. A new Firefight map called Installation 04 takes after one of the second level's Forerunner structures, while favorites like Beaver Creek and Hang ‘Em High are re-imagined. You can use those maps with last year's Reach disc, too. The cross-compatibility feels a little awkward but is likely there to try to please everyone at once. We still don't know what kind of Halo game 343 will make and no amount of replaying the first Halo is going to tell us. CEA makes crystal-clear why people pledge loyalty Halo, and why others hate it as well. It's not going to change how you feel about the franchise. The achievement here is mostly technical. Classic Mode essentially bakes in a nostalgia mechanic into a game that's already well-loved. But, when I compare Anniversary to Reach, I come away with more admiration for Bungie's last dance with Master Chief. Reach walked that tricky line of channel their fanbase's nostalgia while changing certain elements to add variety to the campaign. In the name of respecting their forerunners, 343 Industries plays it super-safe here. This game isn't Skyward Sword, which re-imagines and re-tools the foundational elements of the Legend of Zelda games and adds in some customization for the first time. Nor is it Ultimate Marvel vs. Capcom 3, which adds under-the-hood improvements and more characters to brawl with. All the things you love about the first Halo—the scale of the world, the strategic cunning you'll need to wield in certain battles and the endearing quirks of certain weapons—are still there. The most positive way I can look at Anniversary is as the summing up of an era. 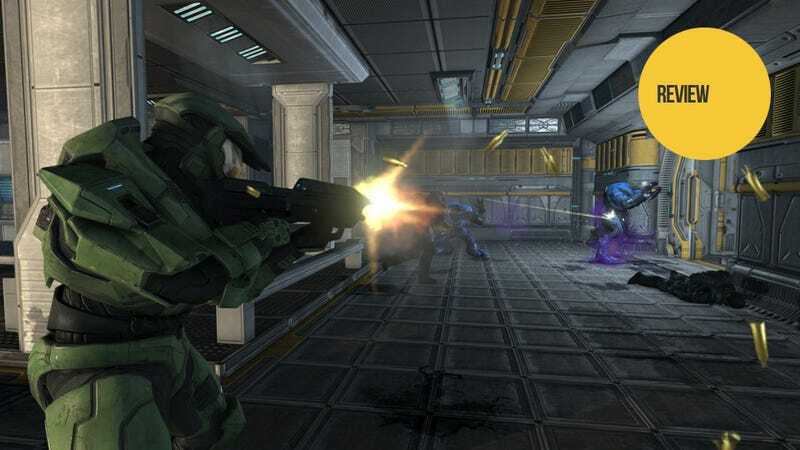 From the initial release of Combat Evolved to the powerful exit with Reach, the Halo games made by Bungie created and codified the expectations a whole generation of gamers have about what they get from first-person shooters and online multiplayer.